The Yellowstone cutthroat trout is characterized by medium-large spots with rounded edges that increase in number toward the tail fin. Coloration is highly variable, but the body is usually yellowish brown, silvery, or brassy (Behnke 1992). In Yellowstone Lake, most silvery colored individuals are females or immature males; mature males are usually darker (R. Gresswell, unpublished data). 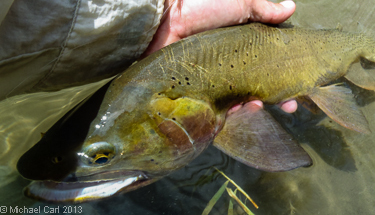 Bright colors are common on individuals (especially on large males) collected from spawning migrations in tributaries of Yellowstone Lake (R. Gresswell, unpublished data). Yellowstone cutthroat trout appear to be opportunistic feeders that consume food items according to availability (Thurow et al. 1988). Although diet studies for Yellowstone cutthroat trout are uncommon, trout in streams generally feed on drift, benthic invertebrates, and other fish (Allan 1995). Research suggests a strong terrestrial (e.g. hoppers, bettles) influence on drift in some headwater streams where there is a tight linkage with adjacent riparian areas (Romero et al. 2005). 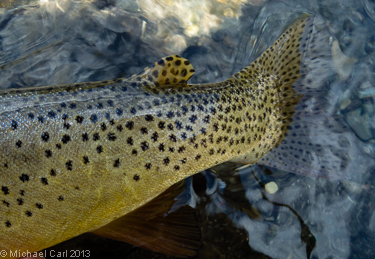 Yellowstone cutthroat trout occupy a diversity of habitats. Lacustrine populations are found in waters ranging from the size of small beaver ponds to large lakes (e.g., Yellowstone Lake). Fluvial populations were historically common in large rivers such as the Snake River above Shoshone Falls, Idaho and the Yellowstone River near Livingston, Montana. 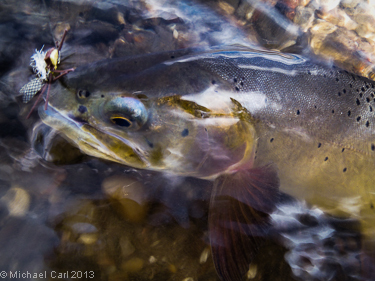 Many of these large-river populations have declined or disappeared. 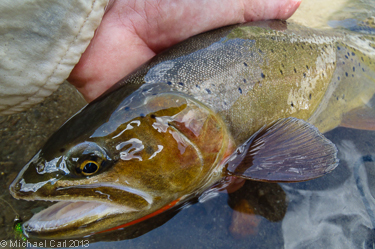 Nevertheless, Yellowstone cutthroat trout are still abundant in many small headwater streams (May et al. 2007).